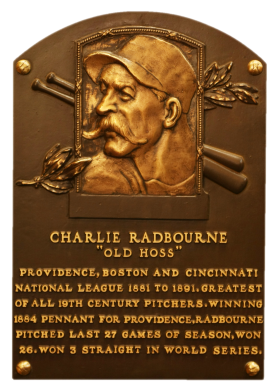 "Old Hoss" Radbourn was one of the 19th Century's most colorful characters. He was the prototypical 19th Century pitcher, pitching at least every other day and usually pitched upwards of 600 innings a season. He was also one of the top pitchers of his era. During the 1884 season, he complied astounding numbers: 59 wins, 73 complete games, 441 strikeouts, 11 shutouts and a 1.38 ERA. These numbers were indicative of his 11-year career where he completed 484 of the 497 games he started, winning 309 of them. Comments: In May of 2005, I pulled off the biggest card purchase of my life up to that point. 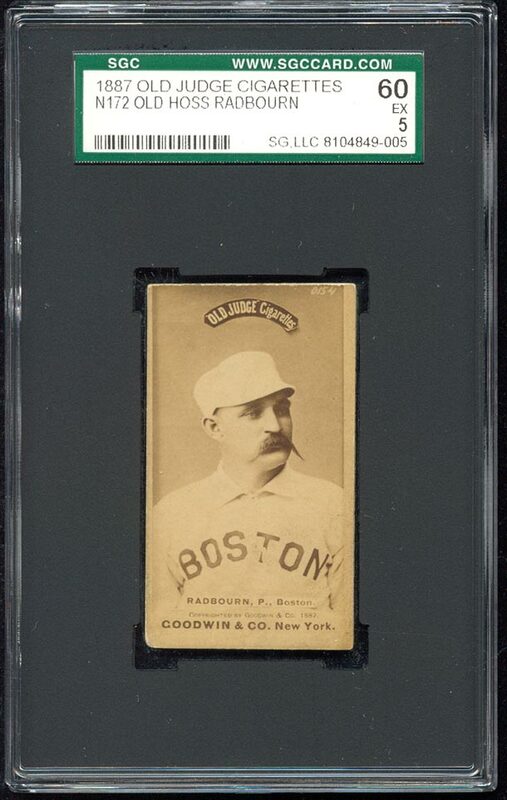 The REA auction closed and I won two cards - this Radbourne and a N-162 Goodwin Champions Keefe SGC 60. After the auction closed I called and requested signature receipt. I received a tracking number and nervously waited for the cards to arrive. In complete excitement, I waited and waited for the package to arrive and check the Track & Confirm website hourly. Eventually my anticipation was rewarded when the tracking number kicked back "Delivered". How? I wasn't home and the package required a signature. Would you believe the cards were shipped in a FedEx box overnight and left between the screen and front door by a FedEx courier? I was at work and unable to accept the box. This was an emergency. I jumped in the car and drove home to the front door. I was very lucky nobody took off with it. The package was there - in between the screen door and regular door - for all to see, and all to steal. Luckily nobody took the chance. I love the handlebar mustache and learned a lot about Hoss after picking up this card. All the stories about him "flippin the bird" are pretty cool and make me wish I could go back in time to have a beer with the man. This card will always be in my top ten. In this instance, the photographer captured Radbourn in his Boston uniform, sitting in a casual posture that reveals Radbourn's confidence as clearly as it does his perfectly maintained handlebar mustache. It is also by far the rarest and most desirable of the six different cards in the set featuring Radbourn, and one of the rarest of all N172 Hall of Famer poses. This is an exceptional specimen in all respects with extraordinary photo quality and contrast. The Hall of Famer's image is crisp, the contrast is superb and the centering is not unflattering. All four corners exhibit nominal wear (heaviest at the lower left) that does not diminish the piece's considerable visual impact. 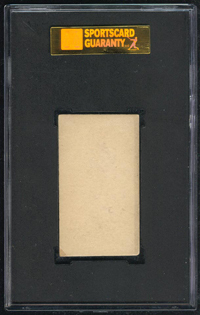 The blank reverse properly complements the card's character and is suitably clean. This is an exceedingly desirable portrayal of the legendary figure, and one of the few portrait-configuration examples of its type known to exist; just one Radbourn Old Judge of any pose has achieved a higher SGC rating. Excellent condition, in the strictest technical sense, but highlighted by a luminous, stellar likeness. 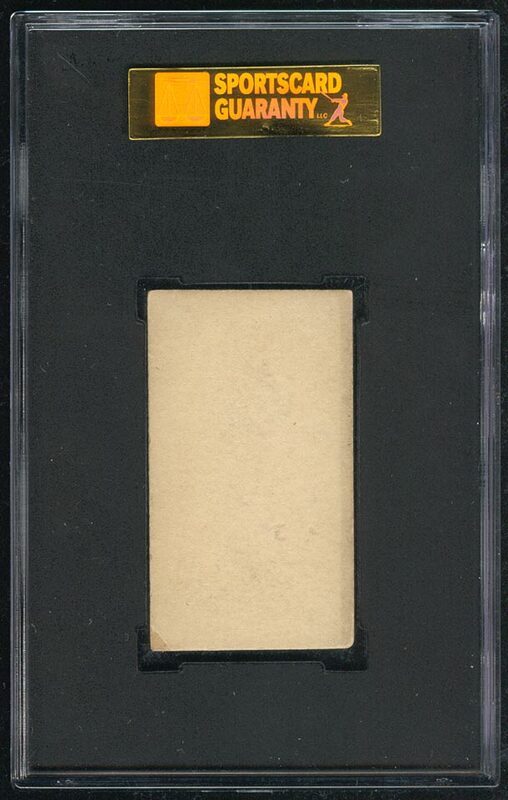 A tiny surface chip in the lower left corner of the blank reverse keeps this beauty from a higher grade. The image really "pops" on this extremely impressive card. One of the best examples of this significant key Old Judge Hall of Famer rarity in the country.